In late 2015 Rolf Fuhrmann, Managing Director of Mann Engineering formulated a plan to investigate potential opportunities in the global Aerospace Industry. 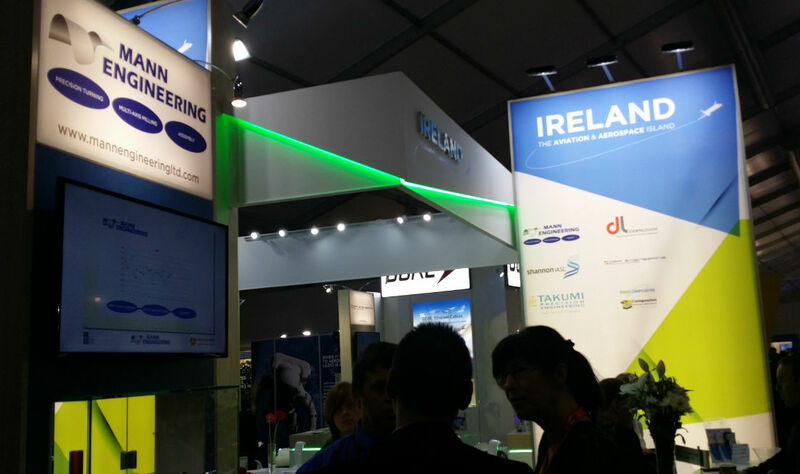 This started out with a fact finding mission of displaying at the 2015 Paris Airshow through and with the help of Enterprise Ireland. In early 2016 Mann Engineering joined the ADS Group (Aerospace Defence Security & Space) and began implementation of the SC21 Programme (Supply Chain 21st Century) as well as starting to implement these advanced Lean practices, we also began the qualification process for AS9100 Rev C.
After successfully displaying at the 2016 Farnborough Air Show, Mann Engineering gained the AS9100 Rev C accreditation in September 2016 from NQA. There was a major change worldwide in the AS9100 Accreditation program in 2017, where it went from Rev C to Rev D. Instead of a one day annual surveillance audit, this meant a complete three day re-audit for Mann Engineering. In November 2017, Mann Engineering were awarded AS9100 Rev D and became one of the first companies in Ireland to achieve this award to the new standard. It is a credit to the Production and Quality teams at Mann Engineering as well as our external consultants Almir, that after three days of severe auditing by the NQA auditor, that they only found one minor, which was promptly actioned. Two years on from an initial foray into the potential of entering the Aerospace industry, with Rolf’s foresight, drive and continued investment, Mann Engineering is now ready and most importantly, qualified to start producing components for the global Aerospace Industry. Mann Engineering is also proud to be one of the founder members of the Emerald Aero Group (EAG) which is a cluster of 14 Irish Engineering companies working within the Aerospace Industry. For over 40 years, Mann Engineering has supplied sub-contract machining services to a wide range of industries, including Oil & Gas, Aerospace, Telecoms, Electrical Distribution, Marine & General Engineering, both in Ireland, the UK, Germany, Poland and Norway, in a wide variety of materials from bright to high grade mild steels, aluminium (6061T6, 6082), copper, brass, plastics, nylon, Teflon, as well as various stainless steels (303, 304, 316) and are viewed as specialists in machining precision turned parts in exotic materials such as Hastelloy, Monel, Titanium, Inconel, 254-MO and 17-4PH.